A third-grade teacher in Boston who won $150,000 in an online contest donated her entire winnings to her school. 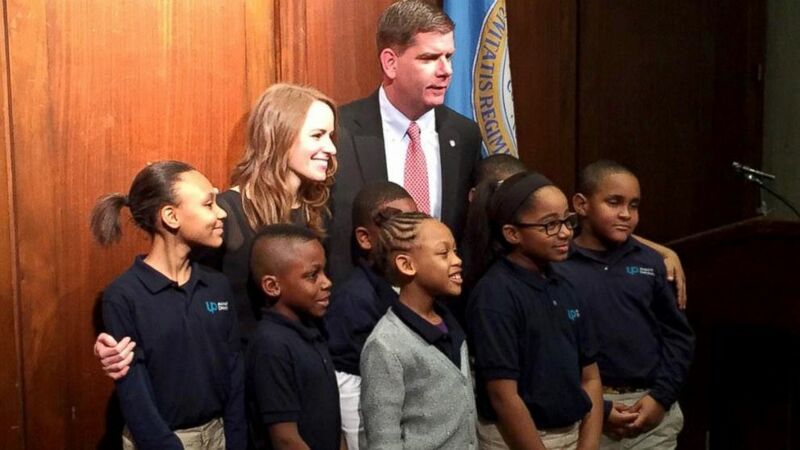 Nicole “Nikki” Bollerman, 26, was honored this week by Boston Mayor Marty Walsh after she donated her grand prize of $150,000 from a Capital One #WishForOthers contest that also funded three books per student. Bollerman teaches general third-grade education at UP Academy Dorchester, a public charter school that's a year old. “My #wishforothers is that my voracious, adorable, hardworking, loving scholars all leave for their December break with a book in their hand,” wrote Bollerman in her winning entry, according to the school's website. Capital One's video of the book unveiling has been viewed about 900,000 times. Bollerman said she has been working with school administration to make sure the gift will “improve the lives of the students,” including better computer access and coding lessons for the children, though the school has not made any commitments yet. 1. “Diary of a Wimpy Kid: The Long Haul,” the latest book in the popular children's series. “Those kids just eat up those Wimpy Kid books,” Bollerman said. 2. “My Father's Dragon,” a 1948 novel by Ruth Stiles Gannett, “one of my favorite chapter books growing up,” Bollerman said. 3. “Where the Wild Things Are,” by Maurice Sendak, who grew up in Bollerman's town. “I wanted the kids to have a picture book to share with their younger brothers and sisters,” she said. Because Bollerman wanted all the third-graders to have books to read over December break, she and her mother bought each child not in her class a book as well.